I made doughnuts for the first time in my cramped Chinese apartment kitchen years ago. I knew nothing about oil temperature, so I cranked the flame to high on my propane stove and heated the oil dangerously hot. I confidently started sliding doughnuts into the boiling oil, though, and watched with dismay as they burned to a blackened crisp within seconds of touching the oil. Needless to say, they went into the trash and I didn't get any doughnuts that day. Although I never mastered doughnuts in my Chinese kitchen, or frying anything for that matter, I did bake some pretty great cookies in my tiny little stove, usually of the peanut butter and chocolate chip variety. Sundays lately have been sweet as we've been experimenting with various doughnut recipes. Delicious experiments, to be sure, although not all of them worth sharing. 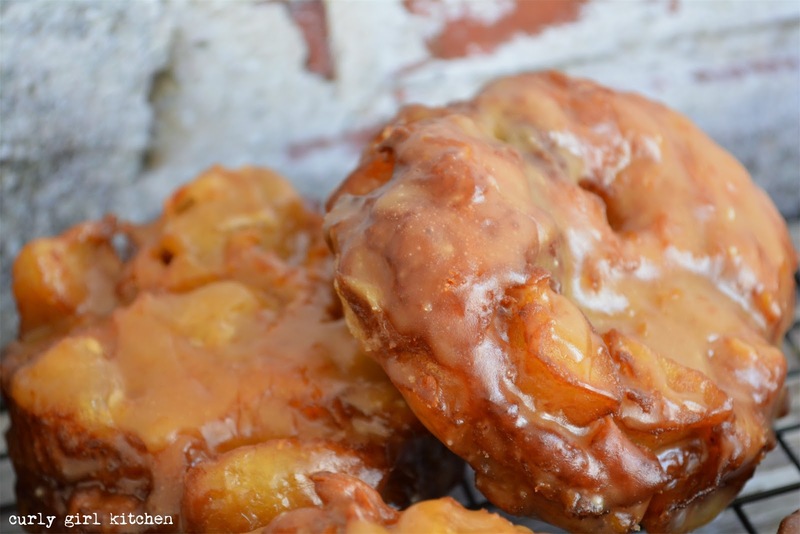 These apple fritters, though, are some of the best doughnuts I've made. 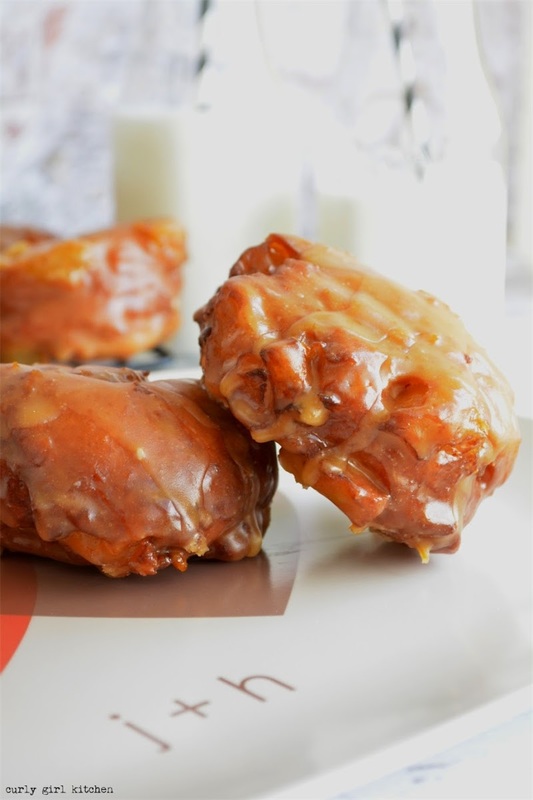 Soft yeast dough spiced with cinnamon and nutmeg is stuffed with a tempting amount of tart apple filling and then fried until golden, before getting dipped in a sweet orange maple glaze. 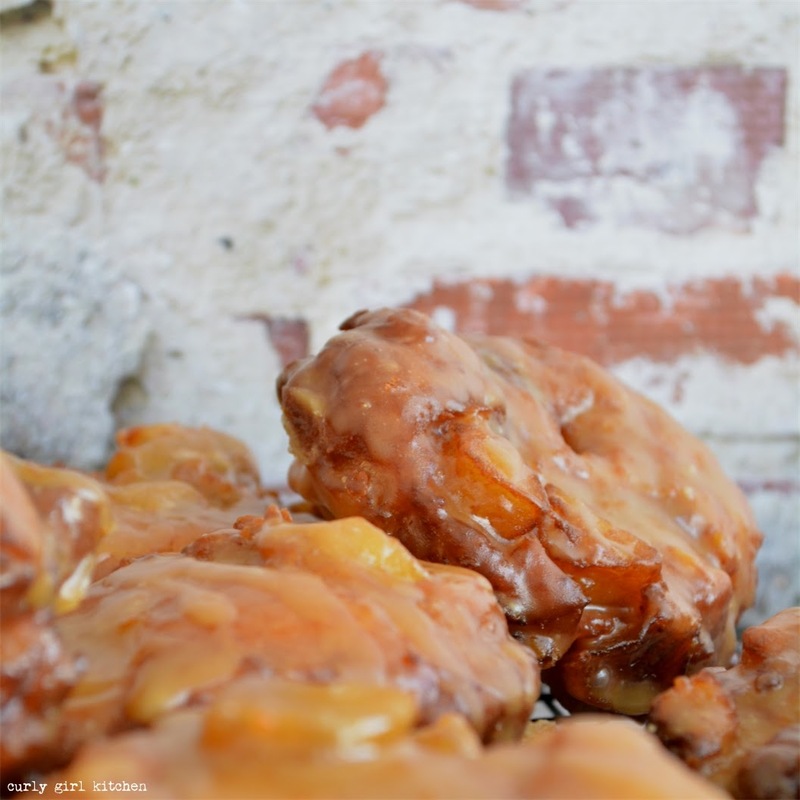 The first bite into the golden crisp dough coated in that sugary maple glaze, your mouth filling with hot spiced apples and a hint of orange, is pure felicity. 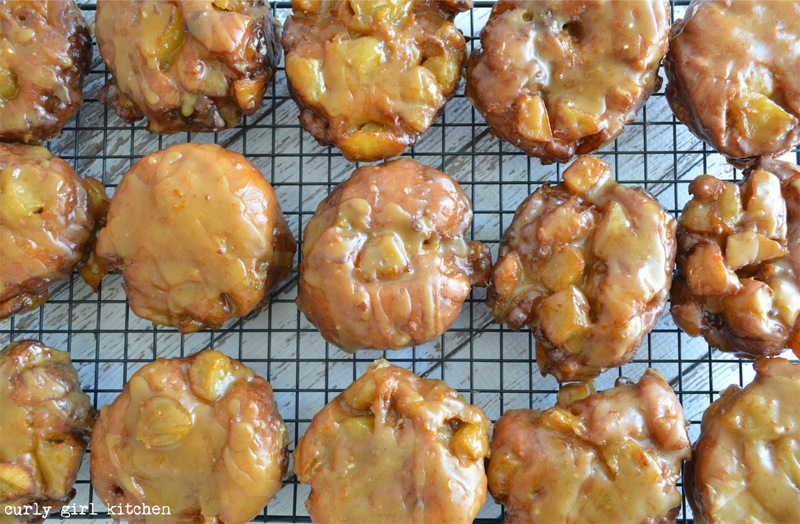 These are best the same day they're made, since the apple filling can cause the fritters to become a little soggy the following day. Make them for a hungry crowd one weekend morning and they will disappear fast. In the bowl of your stand mixer, combine the hot water and yeast and let stand for about 5 minutes, until foamy. Add the yogurt, butter and vanilla, and mix with the dough hook. In a bowl, combine 2 cups of the flour, sugar, salt, baking powder, baking soda, cinnamon and nutmeg. Add by spoonfuls, with the mixer on low. Increase to medium speed and knead the dough for 4-5 minutes (adding another tablespoon or two of warm water if the mixture is too dry), until the dough slaps against the side of the bowl and the dough springs back slowly when pressed. Place the dough in a greased bowl, cover with plastic, and set in a warm place to rise until doubled, about an hour. 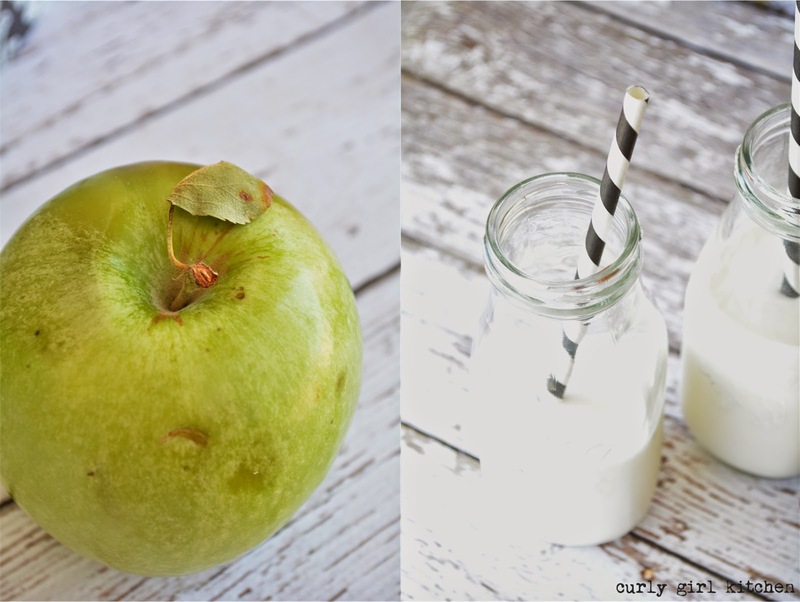 In a saucepan, combine the apples, brown sugar, cinnamon, orange zest and orange juice. Over medium heat, simmer until the liquid has mostly evaporated and the apples are softened but still hold their shape. Set aside to cool. Dump the risen dough out onto a generously floured surface and press out into a circle with your hands. 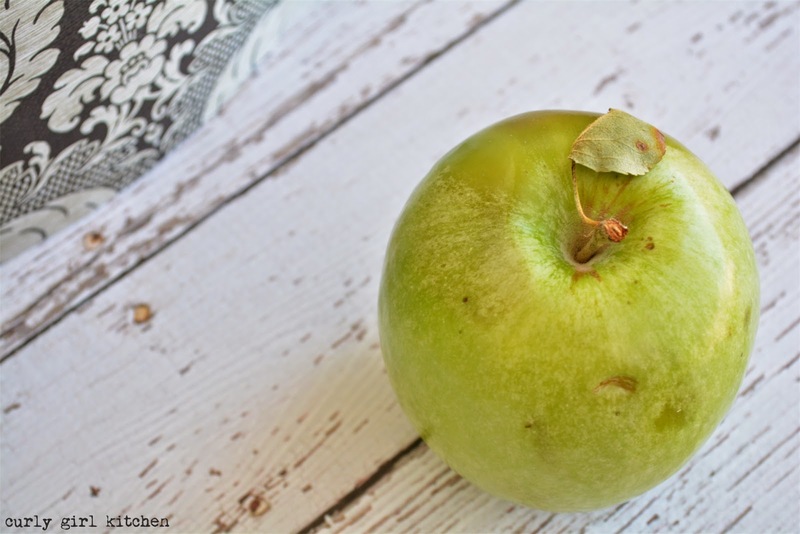 Dump the apples on top, and gently knead the apples into the dough until dispersed throughout, adding the remaining cup of flour as needed to keep the dough from being too sticky and wet. Press the dough out to about a half inch thick, and cut into 15 fritters with a 2 1/2 - 3 inch biscuit cutter, gathering up the scraps to cut the remainder of the fritters. 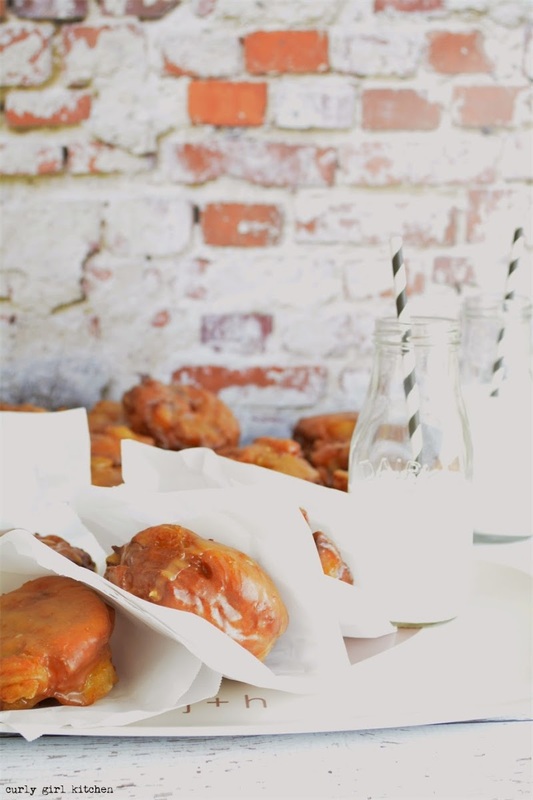 Place the fritters on a piece of parchment paper. Cover loosely with a towel and let rise for 45 minutes while you heat the oil. In a large pan, heat 2-3 inches of oil to 365 degrees. Carefully lower the doughnuts into the hot oil, working with just a few at a time, and fry for about 2 minutes on each side, until a deep golden brown. Transfer to a baking sheet lined with a wire rack to cool slightly while you make the glaze. In a saucepan, whisk together the sugar, orange juice, orange zest, corn syrup, maple extract and vanilla extract. Over medium heat, whisk to dissolve the sugar. Whisk in the powdered sugar until smooth. 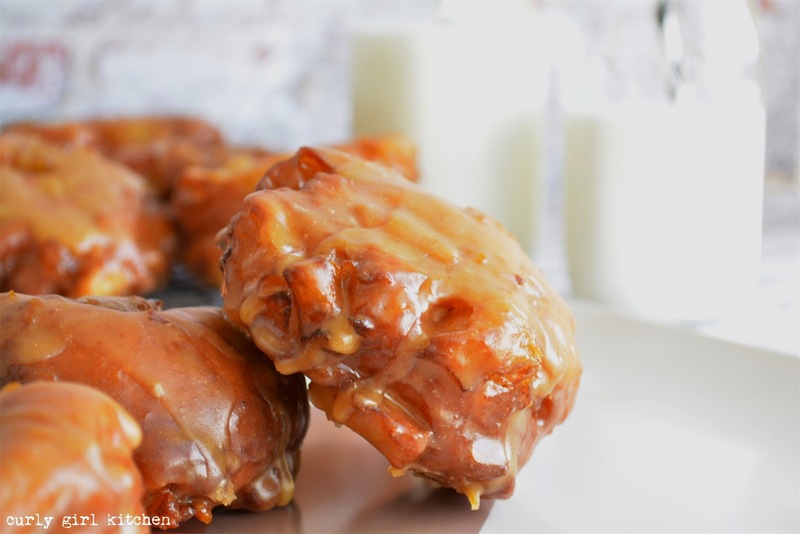 Dip the doughnuts into the hot glaze, using tongs of needed, and set back on the wire rack. Glaze will set in about 5-10 minutes.